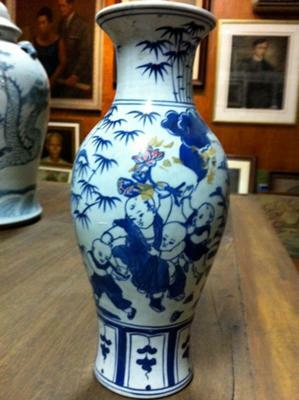 Here is nice interesting vase with children playing with red colored flowers reign mark. Comments on era and rarity are again most welcome. This is an easy to recognize fake. The decoration uses a blue tone that isn't right for the period. The drawn lines are too thick and even, and give the impression of being printed. There seem to be other discrepancies that I cannot see clearly due to the small pictures. 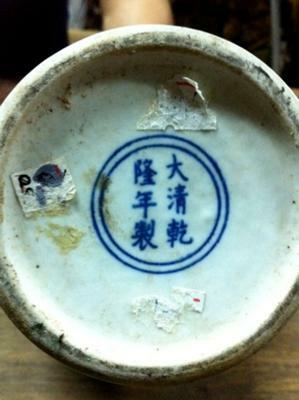 This type of bottom did not exist at all in traditional Chinese wares until the 20th century, and the Qianlong reign mark is completely different from period marks. Qianlong marks used mainly seal type marks.